Last Friday, I posted about making Easy Salmon Cakes. I made two too many — which isn’t enough for another dinner, but just enough for a lunch. 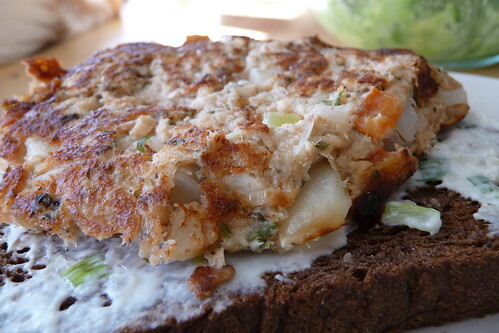 Believe me, those salmon cakes on a thick slice of dark, black bread with a schmear of garlic sauce are divine. I’d rather have them this way, in an open-faced sandwich, than as a main with some other starch on the side. We’ve been playing with our recipe for Garlic Sauce and have settled on a slightly modified version which we like better. So I thought I’d take the opportunity to encourage you to try making our new and improved garlic sauce. The ratio of mayo to sour cream is entirely dependent on the whim of the cook. If you prefer the taste of mayo more than sour cream, reverse the amounts. Or use less of one and more of another. This is how we like it, but we adore sour cream. Mix all ingredients together in a small bowl and chill until needed. This entry was posted in american, recipes, sauce, seafood, snack, untranslated. Bookmark the permalink.